Things just got 25 percent better for UFC newbies. The planet’s premier mixed martial arts promotion has loosened up its purse strings and increased the minimum their newest athletes can earn for a victory to $20,000. The least a UFC fighter can now make for a bout is $10,000 to show, and another $10,000 to win. Fighters had been receiving $8,000 to show and $8,000 more if they got their hand raised. Canadian reporter Adam Martin recently confirmed the pay bump with a manager whose client competes in the UFC. The raise isn’t drastic, and will only affect a small group of fighters – mainly some preliminary card participants and contestants coming off “The Ultimate Fighter,” but it’s better than nothing. UFC rookies typically signed the same four-fight, $8K/$8K contract to join the promotion. How well they performed in those initial four bouts would directly impact their next deal. Taking into account the UFC’s new sponsorship agreement with Reebok, which kicks off July 6, fighters on their first UFC contract will now earn a guaranteed $22,500 ($10,000 to show, $10,000 to win, $2,500 from Reebok) in each of their first four wins. If a UFC fighter completes their initial four-bout contract, they could earn as much as $90,000 for their efforts. On the flipside, an unsuccessful fighter could pocket as little as $50,000 (assuming they didn’t get fired after going 0-3). Healthy UFC fighters at this pay scale typically compete three-four times a year. Of course, UFC fighters have the opportunity to earn more with spectacular showings. The UFC shells out one “Fight of the Night” and two “Performance of the Night” bonus checks ($50,000 each) after every event. In addition, the UFC is notorious for handing out top secret discretionary bonuses to fighters who go above and beyond the call of duty. It appears the UFC’s new minimum salary went into effect last Saturday at UFC 187. 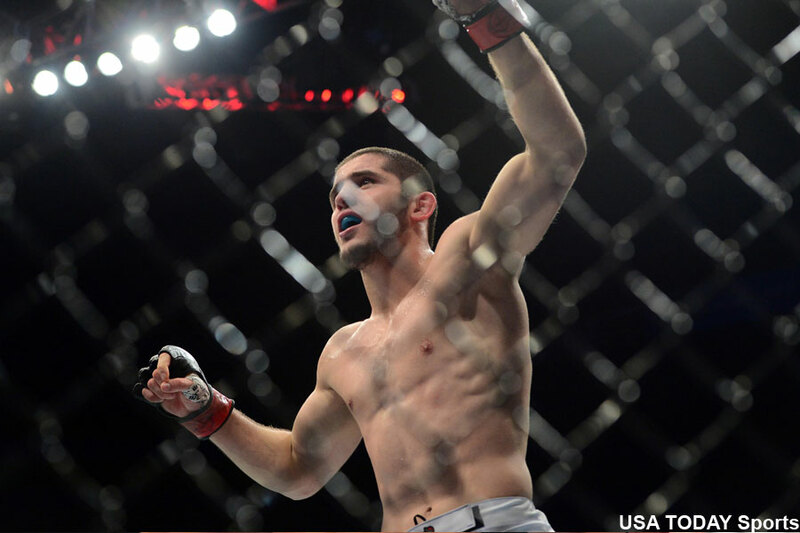 Islam Makhachev (pictured) made his UFC debut by scoring $10K/$10K for his opening bout win over Leo Kuntz.